Watch ABC's 7.30 Report's video about ManGo. Read the Sydney Morning Herald article on the car. They developed the specifications and hand built the car. "It's a pretty radical design: a four-wheel drive with a motor in each wheel, eliminating the need for mechanical brakes," says Associate Professor Michael Roberts, who conceived the project. "The motors are used as brakes and actually recharge the car's battery when it is running down hill. "There are no axles, differentials or gear boxes. So the car is nimble, light and inexpensive to run. "It also makes the car simple to build: the mechanics have been replaced with software and inexpensive electronics." Professor Roberts says, the wheel motors of the ManGo will be three times more efficient than a petrol engine. And the efficiency is boosted further because electrical energy can be recovered and used to recharge the battery. He says the prototype would require a lot more engineering before becoming a marketable vehicle but highlights the relative simplicity of electric car technology when compared to petrol engine vehicles and low barriers to entry for the emerging industry. "It reminds me of the emergence of computer hardware in California 30 years ago. Back then, big name companies such as Sperry-Univac, Control Data and Burroughs dominated the computer industry. These companies are now consigned to the history books, having been usurped by the PC. "I see the same think happening with cars. While the big names in the industry are fighting for survival, there is an opportunity for smaller companies to enter the field with a simpler product that better meets consumer demand." 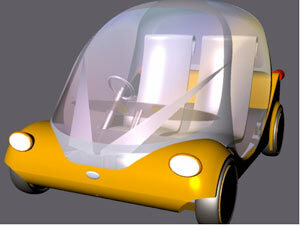 The ManGo concept car was presented by students from the Faculty's Advanced Engineering Network at the Seymour Centre on 23 September.